Enjoy sophisticated, relaxed traditional styling in this stunning design. The Positano Reflections Bedding Ensemble features large scale damask motifs of blue grey embroidered against natural linen. 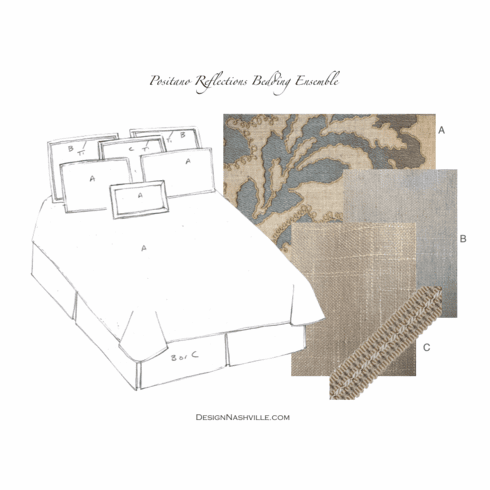 Softer blue grey linen and silvery linen provide classic accents. All workmanship is of the highest professional quality. Patterns are cut to center within each piece and match from piece to piece as well as at the seams. All stress points are reinforced. Fabric edges are finished with overlocking seams. Pillow shams and duvet cover are made with industrial quality, easy gliding zippers with flap closures. Two linen blend Euro Shams fabric B blue silver 26 x 26" plus 1.75" flange on each side. Decorative gimp makes a mitered frame on the flange portion. 1 Euro Sham fabric C linen blend 26 x 26" plus 1.75" flange on each side. Decorative gimp makes a mitered frame on the flange portion. 2 Qn or Kg shams embroidered fabric A with self flanges of 1" on each side. Face of the shams are lined. 1 Rectangular Pillow Fabric A with mitered borders of fabric C, fabric C on back. Qn 15 x 20, Kg 16x22"
1 duvet cover Fabric A embroidered damask with solid linen blend back fabric B or C. Self flange is 1" on three sides. 1 Optional skirt Tailor pleated as sketched. Fabric B silver blue or C linen. The unlined skirt is of substantial weight and opacity. Positano Reflections Bedding is custom made to order. Contact us for assistance with custom orders and to order using a deposit rather than full payment at checkout. Cal King 104" x 102" allows drop of 16" on all sides plus 2"of length"